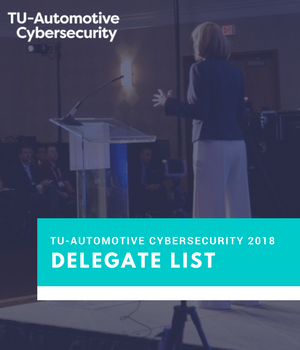 TU-Automotive Cybersecurity (June 6-7, Novi) - co-located with TU-Automotive Detroit, the world's largest automotive technology conference & exhibition - is the undisputed annual gathering place players from research labs, automakers, tier 1’s, security researchers, and the complete supply chain to plan for the imminent future. The conference unites 3,200 players from automakers, tier 1s, government, research labs, software companies, start-ups, VCs and many more. This is where the deals are done! Here's a sample list of companies and the job titles that you could meet at the show. The list is scrambled for data privacy reasons. Investment Manager Instant Security and Safety Inc.